Here’s a question for us all today: Where is our life? Asked other ways: From where do we draw our life? What is it that we build our life around? What is it that is at the depths or core of our life? What has captured our heart? On what is our mind set? Today’s Epistle reading from the Lectionary (Romans 8:6-11) addresses these questions, and we’ll also look at this week’s Gospel reading (John 11:1-45), which tells of the time Jesus’ disciples and dear friends, Mary and Martha, sent our Lord a desperate message: “Our brother, the one you love, is sick and he’s dying. Come, lay your hands on him and heal him.” They knew if Jesus would come, and just say the word, or touch him, that their brother Lazarus would be healed. But for whatever reason (and Jesus had his reasons) he waited. He did not go immediately to Lazarus’ side. Can you imagine the sisters’ despair? Dear ones, that is the question for us today—Do we believe this? Do we believe that in Christ we have life? Not just life someday, not just at the last day, but life today—now. Do we have life in Christ right now? In Romans 8, we read of the difference between life in the flesh and life in the Spirit. First-century Greek philosophers told people that the soul was immortal and would live on beyond death, but that their body would die. I’m not sure whether the soul would just float around or what, but that’s what they taught and what many believed when Paul wrote his letter to the churches in Rome. Unfortunately, because of our bad choices, we brought the sentence of death upon ourselves. Nevertheless, God continued to sustain us. Rather than making us simply disappear because of our sin, he said to humanity: “You will live, yet I will limit your life to a certain number of years, and then you will die.” But God did something else—something truly marvelous—he gave us himself in the person of his incarnate Son, Jesus Christ—the “I Am,” who is life, came to give life to us by his Spirit. In Ezekiel 37, we read about dry bones and how the Spirit of God breathed life into those bones so they lived. Into dry, dead bones, God through his Son and by his Spirit brings revival—new, never-ending life. This is the life that is ours in Christ. He gives us life beyond death—life everlasting that transcends this mortal life in an earth-bound, mortal body. So I ask again, Where is our life? On what are our minds set? On the physical life we’re living every day? A life that one day will be gone? Or are our minds set on the life that God has breathed into us by his Spirit—the life of his Son that revives us, that makes us truly alive? From where do we draw life? What occupies our thoughts? On what do we spend our time and energy? Physical needs? God said when we seek his kingdom first, these things will be added. So what do we seek first? Where is our focus? On self? On the flesh? Or is it on Christ, who is our life? By the Spirit, Paul declared in Galatians 2:20: “I have been crucified with Christ.” Holy Week begins next Sunday. During that week we are powerfully reminded of Jesus’ crucifixion, of the reality that in union with Christ, we are crucified with him. In Christ, our old way of being, our old life, is dead—crucified, as it were, with him. Paul continues in Galatians 2:20: “and I no longer live, but Christ lives in me.” Think of that—the “I Am” who is the Resurrection and the Life lives in us! Paul continues: “The life I now live in the body, I live by the faith of the Son of God, who loved me and gave himself for me.” Amazing! Transforming! Back to the story of Lazarus. We find Jesus standing there, having spoken to Martha when Mary arrives and says pretty much the same thing to him: “If you’d been here, this wouldn’t have happened.” Jesus was grieving—both the death of his dear friend Lazarus, and now the deep sorrow of his dear friends Martha and Mary. Perhakps he was also grieving (a bit perturbed, it seems) their lack of understanding. In his great love for these people, and for all humanity, Jesus got to work. 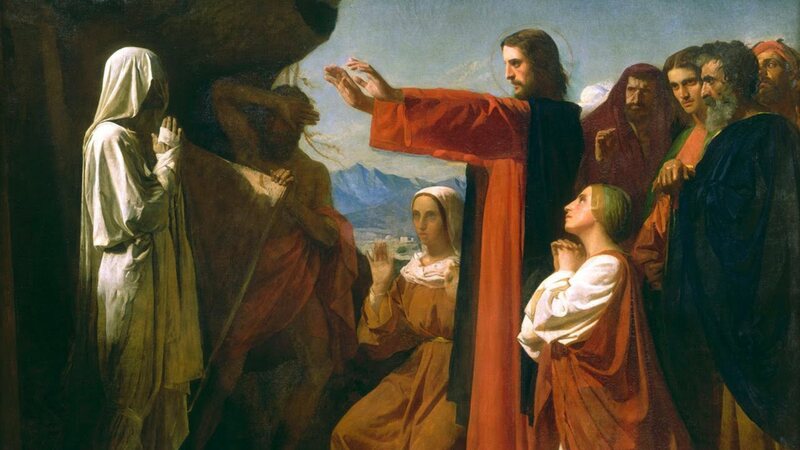 He gave the command: “Remove the stone.” Jesus was in charge—he was calling Lazarus back to life, but note that he was engaging others in this event. He let some bystanders participate in his life-giving miracle. Jesus instructed them to remove the stone that sealed Lazarus inside the tomb. He could have removed it himself, he could have called out “Lazarus,” waved his hand, and a hole would have opened in the rock face of the tomb. But he didn’t do that. Instead, Jesus said, “Remove the stone!” He let them participate in what he was doing—giving life. Martha, watching all this, said, “Jesus, by now he’s stinking. Don’t do that!” But Jesus replied, “Martha, if you believe, you will see the glory of God.” How often God calls us to belief—“just believe,” he says. But believe what? Believe that there is something beyond this life—beyond the every-day-just-trying-to-survive-stuff. There is a life that is much more than that—so much greater. Yes, today’s sufferings can be painful, difficult, frustrating—but there is life through all that and beyond. It’s Christ’s life in us. It’s the life we live with and in him. It’s the life in which we are never alone. Sure, sometimes the life we face here and now is tough. Perhaps we can’t pay our bills, perhaps we battle debilitating health problems. But God, who loves us, makes a way. Don’t ask me how. He just does. And part of the miracle is the way we participate with one another in bringing such life-giving deliverance to pass. Paintings of this scene typically portray Jesus with his hands extended, calling Lazarus out. In like manner, Jesus is calling each of us out, saying to us, “Wake up!—awaken to the life that is yours in union with me. Live into that life, it’s real life—eternal life.” He says to us, “I am the Resurrection and the Life.” Indeed, he, the Great I Am, is our life! Believe it. Receive it. Live into it. Thus Jesus called Lazarus forth from death. It’s interesting to note what Jesus then said to the people observing all this: “Unbind him and let him go.” Again, Jesus had them participate in his miracle of deliverance from death. And so it is today as Jesus calls us to participate in what he is doing to give life to others—to unbind their burdens, to set captives free to live in, with and for Jesus. In his epistles, Paul often mentions “putting on” Christ—putting on his kindness, goodness and mercy. This is the new life of Christ that, by the Spirit, we have been given and are led to embrace. Putting on is not about faking—it’s like donning a costume that defines a particular role. It’s about sharing Christ’s own life and character. We don’t have our heads buried in the sand—we are realists, we acknowledge our inability to do what we need to do to save ourselves—be that physically, mentally, emotionally, or spiritually. Confessing our weakness and sin, we draw upon God’s life—his healing, his hope. And we do so together, in community. That’s why God calls us together as a church. The evil one likes to remind us of our weakness and confuses us by saying good is evil and evil is good. He tempts us to do things that feel right, but are terribly damaging. But in relationship with Christ-followers in the community of the Spirit, we love, help, exhort and even correct one another. Always in love. Always caring for one another, praying for one another, helping each other shed the graveclothes that continue to bind us. The unbinding is a process of healing, of changing. We help each other take off the old and put on the new. Father, thank you for giving us your Son Jesus. Thank you, Jesus, that you are the Resurrection and the Life, and that by your Spirit, we are made new. Lord, speak to us now and show us how in each of our lives, as we listen in our hearts, how you are the Resurrection and the Life. Thank you Jesus for coming to be in us, with us, and for us in real ways. Thank you Father, that through Jesus and by your Spirit, we have life not just in the world to come, but now—a new life, a new way of thinking and being. Even though we are weak in our flesh, you love us faithfully. We thank you; we give you all the praise and glory, and we ask you to continue to live this out in us by your Spirit. In Jesus’ name. Amen.